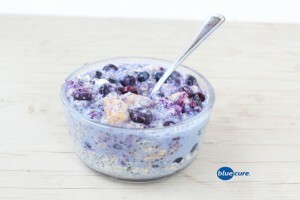 Overnight oats are a quick and easy breakfast idea. Perfect for busy people or just about anyone! With overnight oats, you have no excuse for the… “I didn’t have time for breakfast”… or the reason to stop for fast-food breakfast sandwiches. It take ~5 minutes the night before to prep, and it’s an easy grab-n-go option in the morning. This is one of our favorite combos, but get creative with different fruits, nuts, and seeds. Combine ingredients in a bowl. Start with 1 cup of plant-based milk and add more until desired constancy. Place in the refrigerator overnight. In the morning, stir the oats again. Serve cold or heat up.